Food security means that everybody must have access to affordable, enough, safe and healthy food to meet their dietary needs to lead an active and healthy life. The Western Cape Government works constantly to improve the food security of the people in the province through various programmes and funding opportunities. There are a lot of social and environmental benefits to growing your own food. Not only does urban farming unite neighbourhoods and help combat food insecurity, it also encourages healthier diets. You can grow a range of vegetables in your gardens from the old favourites like spinach, tomatoes, carrots, beetroot, potatoes, mealies, green beans, peas, cabbage, cauliflower, garlic, onions and lettuce. Some entrepreneurs have branched out and grow fancy lettuce, peppers, chillies, artichokes, asparagus, brinjals, zuchini, patty pans, different colour tomatoes, different colour carrots and micro greens to supply the growing demand for different organic vegetables by upmarket shops and restaurants. 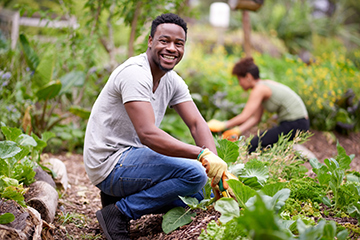 The Western Cape Department of Agriculture actively encourages citizens to start household and community food gardens in an effort to support food security in the province. The gardens provide work in the community. The gardens can serve as a source of financial income. Communities have access to healthy food in the form of fresh vegetables. Communities have access to nutritional meals. The gardens contribute to food security. Community gardens are a greener alternative and provide for a smaller carbon footprint in communities. More food is produced on a small scale which contributes to Food Security in the community. Community gardens mostly use agri-ecological and organic production methods to be viable, which ensures a healthier environment. Communities are provided with healthier food that is free of chemicals. Communities can produce different types of vegetables to exchange and barter with other communities encouraging entrepreneurial enterprises. Communities are able to ensure healthy economy practises by selling their products. Balanced nutrition is introduced to meals allowing healthier lifestyle choices. Community projects on school premises have the advantage of providing food to soup kitchens and school feeding schemes. School children are provided an opportunity to be involved by teaching them about gardening and healthy activities. Growing food locally and selling it in the community reduces the community's carbon footprint and supports a healthier environment. 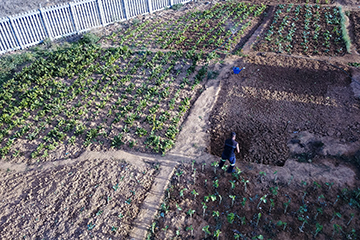 The Western Cape Government encourages and supports community farming projects with funding in an effort to boost food security in the province. In November last year, 17 residents were awarded for a range of food security projects in the province. Minister of Economic Opportunities, Alan Winde said the Department invested more than R20 million in food security projects across the Western Cape over the past 2 years. “Due to the current drought, we’ve adopted water-wise practices in our initiatives. The winners of the competition have also embraced this way of sustainable gardening,” said Alan Winde, Minister of Economic Opportunities. April Jooste, a 100 year-old resident received the special award at an event seeking to celebrate food security in the Cederberg. “Gardening is in my blood. I wanted my own garden from a young age. When I was 18 years old I took over my parents' garden and have been growing my own vegetables ever since - for 82 years,” Jooste said. Jooste is able to feed his own household, and sells the surplus to a local hotel, earning an extra income. Read more about all the winners and their projects. The Western Cape Department of Agriculture has a programme that helps new and established farmers. Are you interested in urban farming? Find out more about the programmes and funding offered by the Western Cape Department of Agriculture?